A week today Jennifer and I fly out to London, then Portugal. 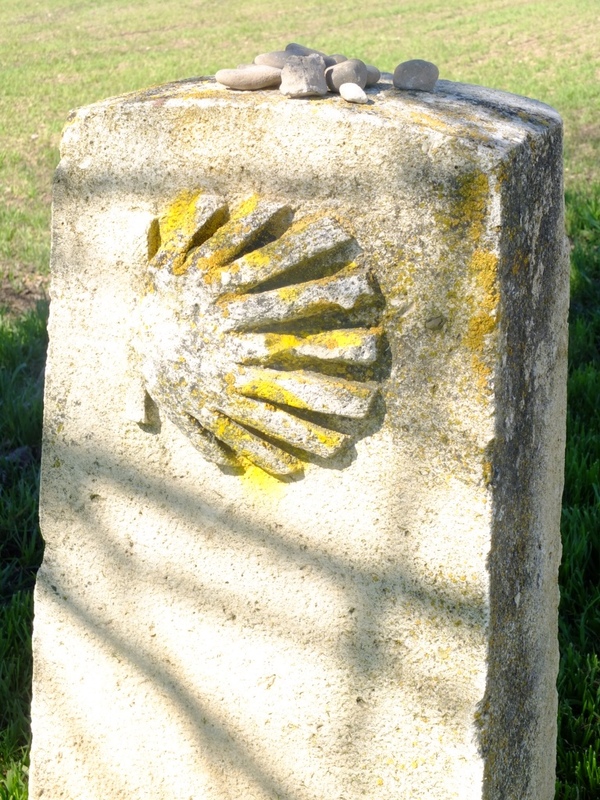 We'll be scouting the Camino Portuguese for our tour which we'll be leading next April. We'll fly from London to Porto, then pick up a car and drive the route, checking out accommodation, restaurants, and points of interest along the way, right through to Santiago. Jennifer and I will be researching the historical, religious and spiritual aspects of the route, and the country we'll be walking through next April. We'll be visiting all the major churches and cathedrals along the Camino. I also want to begin to lock in hotels, rates etc – and find cool places to eat. Already I know a place in Barcelos, famous for its chickens, that has the best grilled Portuguese Chicken in the land. I'll be blogging daily while I'm away, and of course posting photographs. In Santiago Jennifer and I will be meeting up with Marie, who posts here under the name of Marie the Basque. She has already signed up for the tour, and is making the trip over to Santiago especially to meet us. I'm excited to meet her. I'll also be on the lookout for a person who can act as a local liaison – that person needs to speak Portuguese, Spanish, English, drive a van, and have the personal skills to handle the needs of fifteen pilgrims. If any of you know of such a person, again please get in touch. And if any of you can suggest any particular town or place for us to check out, again please let me know. After we've done the tour scout, Jennifer and I are flying to Germany for a few days – there are people in Munich I need to meet re film financing. It will be wonderful to be in Bavaria just before Christmas. Duncan has got two more people for the tour, so we don't have many places left now. Because this is the first time I've led a tour, I want to make sure that Jennifer and I are properly prepared. Exceptional guys. Have a great trip! Thanks Wayne! Are you and Lib back from LA? Yes mate, arrived home last Thursday. A successful trip with lots of shopping at the sales. Ah Wayne – those American sales this time of the year and pretty damn enticing. Hope to see you and Lib before Christmas. Terrific – thank you Steve. I’ll try and reach him Steve – it would be great to touch base with him. He’s done a fabulous job in promoting the Camino, and helping people. He will get right back to you I expect. He is off on Sat and Sun, but I imagine he would come in to meet you. He was great assistance to us. We did not meet him because of the timing and I did not want to ask him to come back just to meet. Johnnie Walker’s email address is : Johnniewalker-santiago@hotmail.com . All the very best for the trip – I hope everything goes super well for you. PS – ‘Caught up with Britta and Janet yesterday at the State Library’s ‘Selling Dreams – 100 Years of Fashion Photography’ – Exhibition – it was a really cool exhibition. Britta and Janet had been to see ‘Gravity’ at IMAX while I chose to get up close and personal with Goya at the Art Gallery of NSW. Both girls are as gorgeous and fun as usual! many thanks for the email address. I wasn’t aware that the photography exhibit was on – I probably won’t get a chance to see it now until I come back. Britta and Janet ARE gorgeous – as are YOU!! Thank you Bill, and cheers! The photography exhibition was just a small one … two galleries only, so don’t feel sad that you’ll miss it – it finishes on 10 November. The best photo was of Twiggy flying along through Battersea Park on a moped … taken by Ronald Traeger. Wow – what a fabulous photo! You can check out the best photos from the exhibition by going to the State Library of NSW website and clicking on Exhibitions and then Selling Dreams. I’ll check out the website. Whilst fashion photography isn’t really my thing – I prefer photojournalism – there has been some amazing work done in fashion photography, and at times it has tipped over into social commentary – most probably as that Twiggy photo you mentioned. But thanks for the tip on the website – I’ll check it out! By the way, Jennifer and I will be back for the December lunch/dinner for the Camino group – when will that be, do you know? Fashion photography certainly does cross over into social commentary … the many extraordinarily talented photographers who’ve photographed models for Vanity Fair for nearly 100 years are classic examples. I love fashion photography as a form of artistic expression – the clothes in many of the images become secondary to the brilliance of the photo itself. Sydney Pilgrims December meeting on 7 December is a lunch one – 12 noon at the new Spanish Club premises at No. 1 Dixon Street, all being well. I hope that you and Jennifer can make it … should be a lot of fun. Jen and I will try and make that lunch. We’re back from our trip around about Nov 24th I think. And yes you’re right about the photographers who have done fashion work. I notice that Deborah Turbeville died only a couple of days ago. I hope Anne can make it to the Dec lunch. It would be great to meet her. Thanks for the link to the photography of Deborah Turbeville. I remember her iconic NYC bath house photos – they were controversial at the time. Anne is hoping to make it to the January dinner but I’ve just checked the calendar and the first Wednesday in January is in fact New Year’s Day so I’m sure that the January dinner cannot happen then. Next week at the dinner I will ask Sandra if the January dinner might go ahead a week later and I’ll let you and Anne know. how about the December meeting though? We can make it to that. The December meeting is lunch – 12 nooon onwards – and it’s at the Spanish Club – new premises at No. 1 Dixon Street. ‘Look forward to seeing you and Jennifer then. You can give us all the goss from your recce! Hi Britta – we really did have some ‘icing’ didn’t we … the afternoon tea treats! It was great to see you and hopefully we’ll catch up at the pilgs dinner Wednesday week. I’m so pleased you had a good time at Gravity. I’m very loathe to endorse films – particularly so enthusiastically as I did in that case – but I really did believe it was an amazing piece of work, and I thought you all on the blog might enjoy it. Isn;t Darling Harbour a treat on a beautiful sunny day? Sometimes I forget just how lucky we are to be living in one of the most beautiful cities in the world. Bill, I hope you two have a wonderful and relaxing time in Portugal-scouting trips are always a lot of fun-and best of luck with your financing opportunity. Blessings! I have my fingers crossed re financing. I truly believe that Sister. I’m just a conduit. As is Jennifer. As are we all, Bill! Its a tremendously exciting way to live, don’t you think? I know of no other way to live Sister! Looking forward to getting back onto the Camino, albeit in a car this time!! Jennifer is right. But then you knew that. I finally made it home to Arizona. I had hoped to meet with Ivar but left Santiago on Monday so our meeting never happened. He and I were going to discuss the albergue listing I created, and hopefully the creation of a pension/casa rural/hotel for the CF. When I settle in I’ll get in contact with him by email. Good to hear you and Jen will be leaving for the recce of the Camino Portuguese, I’ll be looking forward to your blogs. I hope the knee is ok. I sense that it was a very powerful and moving time for you, this pilgrimage. Let’s talk this week on the phone – before I leave? By the way, I am starting up a travel food blog, called Bill’s Road Food – about the stories and experiences behind the food I eat whilst travelling. What about kicking off your new Travel Food blog with a photo of your first airline meal this trip … it’ll be all uphill from that photo!!! Yes, let’s talk this week. The knee is getting better, I’m not taking ibuprofen or using the Voltaren any more, but now that I’m home I will be icing it more regularly. Did come home with a cold and a bit of bronchitis though. You are so right about this Camino being very moving for me. So completely different from last year’s Camino. I love the new food blog! I’m a foodie at heart, althought I’m sure you have already figured that out. I’m following the new blog also. wonderful to hear the knee is on the mend. We’ll talk before I leave. De;lighted that you’re following the food blog – it will be essays, or rather photo-essays on the stories behind the food I discover while traveling. It’s good to be home, except I woke up this morning with laryngitis. What a drag especially since I’d love to chat on the phone with friends. Oh well, maybe my voice will be back tomorrow. do you want me to check with the french “professional pilgrims” about the Porto Camino ? or you just go with your GPS ? Good to meet you in Santiago. Who are the French Professional pilgrims? And how do you think they can help? In France I met on internet and in real life group of retired people who love to walk and walk , they spend huge amount of time on all the caminos, and know almost every stones, people, albergues , they have a deep knowledge of the pilgrimage, every aspect of it.That is why I call them profesional pilgrims, I am sure several have walk recently the Portuguese Camino so they can help if you have doubts , questions about anything, the route, the places to see, the albergues , the hospitaleros, I guess they have the ultimate informations. By the way, a Portuguese friend of mine is looking for a driver for us. And I check with my hotel, they might know the right person. Bill, am now back into the post-Camino, back to work life. Still coming to terms with so much but I am getting there. Made my first goat’s cheese tonight. Yum. Not sure if I told you that I bought the Brierly Guide to Camino Portuguese as a gift for my husband! Sadly your 2014 trip is not possible for me, but Lisbon – SdC in April 2015 is looking promising. In reference to airline food, I order special diet meals – they arrive first, are still hot and have mostly been quite tasty. I speak for the Flying Kangaroo, however, and not other airlines. Can’t make the November or December dinners so hope January will be pushed back a week. The goats cheese does sound yummy, and I’m sure doing that sort of thing is helping ground you after the Camino. How would you like to do a guest blog? I’m sure everyone would be really love to hear your thoughts on how it all went for you. Such a shame you can’t do the December lunch – but we’ll meet up when the time is right!